“Artistic talent is a gift from God and whoever discovers it in himself has a certain obligation: to know that he cannot waste this talent, but must develop it.” ~ Arthur Schoenhauer Sunday was such a joyful day for the family of a ten year old boy from Newport News, Virginia. He’s been visiting his grandparents in Steamboat, and found an opportunity that he didn’t expect when he arrived here – two chances to play the piano in front of an audience of a fully-packed church. The boy is years beyond his peers in his musical abilities. To say he is “gifted” doesn’t quite cover it. 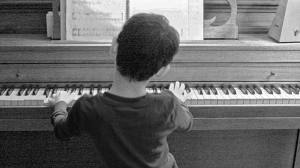 Our first chance as a community to hear this youngster play the piano was Sunday, a week ago. He skillfully played “Let it Go,” from the soundtrack of Disney’s movie “Frozen.” It’s one of my current favorites. Two days ago he returned to surprise his parents by playing Pachelbel’s – Canon on the pipe organ. While the student has been visiting, the United Methodist Church in Steamboat has been letting this talented young artist practice on their piano in the sanctuary. His parents were not aware that he also has been allowed to try his hands, for the first time, on a pipe organ. I got a little teary-eyed as I listened to the boy play the pipe organ so magnificently and skillfully for his young age. I couldn’t help but think about all the young children who have undiscovered talents or not the right opportunities to develop them. In general, communities of caring people need to do better at helping children nurture their innate abilities. Whether a child’s talents lie in the Arts, Science, Communications or any other field that really holds their passions and interests, having strong mentors is important. The most beautiful part of this story – This child already understands the gifts that he has been given and where they have come from. Best to you always, Mason! You really impressed us. This blog brought to you the author of Gift of a Lifetime:Finding Fulfilling Things in the Unexpected, Sue Batton Leonard. Now Available in Audio: Click here for info. and also available in paperback and e-book!